A Sheepdog Diary: "That'll do"
… “that’ll do indeed” I thought as the New Boy and I came to the end of our first training session. It’s been a glorious week so New Boy and I went for our first training session with Alan, whose task it is to teach me to become a sheepdog handler and so train New Boy. We met up with another friend and her youngster, Flyn, not quite a year old and showing lots of promise. Fox, the expert gathered 13 sheep into our training field and held them in place whilst Flyn did his work. After an initial ‘wild’ period he settled down and was working his sides really nicely and developing a good outrun. I’m not quite sure who was the most exhausted at the end of this session … the dog, the handler or the trainer! Then it was our turn. Fox again gathered the sheep up into a nice tight group before he retired back to his mum for cuddles – sshhh, not meant to say that about a rufty tufty farm boy and superb trials dog! “Come bye” … New Boy moved out to our left, then “away” … he changed direction beautifully. I was told to soften my voice – this was a bit of a surprise because during some of my obedience training I’ve been told to make my voice louder! Anyone watching Alan work the sheep at close quarters would think he wasn’t giving commands, move in a bit closer and you will hear very quiet commands. Dogs have exceptional hearing, and soft, quite commands are nice for them to listen to and training is all about pleasant experiences. 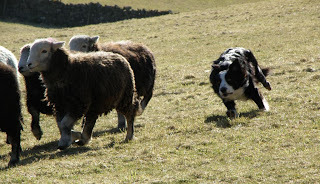 New Boy has been working in tight to his flocks, so we need to teach him to work out from the sheep and also to drive. We started teaching the drive by coaxing him up to the sheep as I moved backwards, then putting him into a “lie down”, then moving the sheep forward again with a “walk up”. He got the hang of this very quickly. We then started to develop the driving of the sheep without me being in front of them. Everything is broken down into very small, manageable chunks. Both Alan and I were incredibly pleased with him at the end of our training. 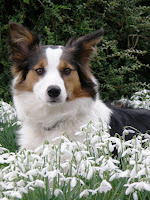 Handsome Lad and Womble Bum have also been in training as they had an obedience competition. If you want to succeed you have to train … I haven’t been doing anywhere enough training with them so wasn’t hopeful of a win. Handsome Lad did very well, although badly hindered by his handler whose brain went to mush on entering the ring … very much a case of ‘great dog, shame about the handler’. Womble Bum frequently surprises me. She has done all the winning so far, but there are occasions when she just has a great time in the ring at my expense. This competition was one such occasion! It’s been a glorious day today. Der spring is sprung, der grass is riz, I wonder where dem boidies is comes to mind. It was clear where the birds were as they were making lots of noise as they busied themselves in the warm sunshine. The snowdrops and crocus were looking lovely … a good place for photographs.